Polio, now eradicated from many parts of the world, is still endemic in Nigeria and outbreaks also occur in other African countries. Nigeria has banned the import of pharmaceutical products through all land borders with the aim of eliminating the inflow of substandard and counterfeit products. Pharmaceutical products can only be imported through the approved ports/channels. Goldstein Research analyst forecast the Nigeria pharmaceuticals market size is set to reach USD 5.3 billion by 2024, at a CAGR of 9.1% over the forecast years. 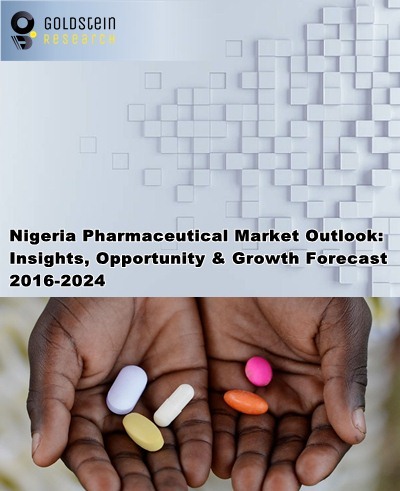 The report covers the present ground scenario and the future growth prospects of Nigeria Pharmaceuticals Market for 2016-2024 and statistics of Branded and Generic Drugs along with the details of ongoing projects in pharma sector in Nigeria. We calculated the market size and revenue share on the basis of revenue generated from major players across the globe. On the basis of type, the anti-infective therapeutic segment will lead the total pharmaceutical with 45% market share as malaria is responsible for 60% of all outpatient attendance, 30% of all hospital admissions and 300,000 deaths annually. Nigeria Pharmaceuticals Market Outlook 2016-2024, has been prepared based on an in-depth market analysis from industry experts. The report covers the competitive landscape and current position of major players in the Nigeria pharmaceuticals market. The report also includes porter’s five force model, SWOT analysis, company profiling, business strategies of market players and their business models. Nigeria Pharmaceutical market report also recognizes value chain analysis to understand the cost differentiation to provide competitive advantage to the existing and new entry players. Our Nigeria Pharmaceutical market report comprises of the following companies as the key players in the market: Sun Pharma, Cipla, Candila. Glenmark, Glaxo Smithkline, Abbott Nigeria, Biocon, Jubilant life, Sanofi Nigeria, Elys, Pfizer, Cosmos, Bayer, Emzor, Fidson, Dawa, Regal, Lab and Allied, Roche, AstraZeneca, Merck. According to the report, major driving factor for Nigeria pharmaceutical market is Nigerian government’s endeavors to crack down on counterfeit drugs and reduce medical tourism out of the country, in addition to achieving, the overly ambitious goal of relaunching the National HIV Vaccine Plan. However, BMI maintains that the government needs to address fundamental issues in the healthcare sector as a first priority. Further, the report states that the major challenge in Nigeria pharmaceutical market is poor infrastructure, counterfeit drugs, a brain drain of health professionals and inadequate funding of the public system mean enrolment in the sector will continue to be slow, hindering growth in the market. Lack of national distributor in order to distribute drugs throughout the country, 36 states have around 300 drug importers (financially strong distributors are the importers) & these importers flood the product in the whole sale market, the retailers come to buy the products from the whole sale market, importers also supply directly to big retailers & hospitals. Based on healthcare financing, healthcare spending in Nigeria is predominantly a private affair, with out-of-pocket spending accounting for 70% of total health expenditure in 2016, compared with just 7 % in South Africa. Private health insurance accounts for about 5% of this expenditure, compared with 45% in South Africa. What is the total market size by 2024 and what would be the expected growth rate of the sales? What is the revenue of Nigeria Pharmaceuticals in 2015-16 and what would be the expected demand over the forecast period?